Thanks to the small but dedicated bunch of sketchers that came down Friday last week to join me on my walk from the Tate Modern to the Tate Britain. Although the weather looked ominous to begin with, it soon brightened up into a warm and sunny afternoon. I think the most interesting sight along the route was that of construction workers dangling from the rafters of the Blackfriars railway bridge, like giant orange bats. It was quite unusual and I'm glad we all got the opportunity to sketch it. We also got a special guest appearance from Urban Sketcher James Hobbs, who happened to be cycling by and spotted us! I chose to focus on smaller details of scenes to try and get more done, as it's quite a pressure when you have to keep moving. Even with our relaxed pace, I found it quite difficult to capture as much as I wanted. I think I'll have to draw some more people next time too! 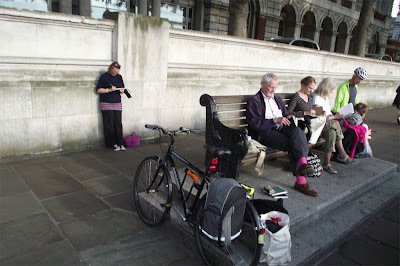 Not everyone could stay 'til the finishline, but a few of us were able to sit down and have a very pleasant drink and compare sketchbooks at the end. Thanks everyone! and I'm looking forward to doing something similar again soon. Details will be posted on here! 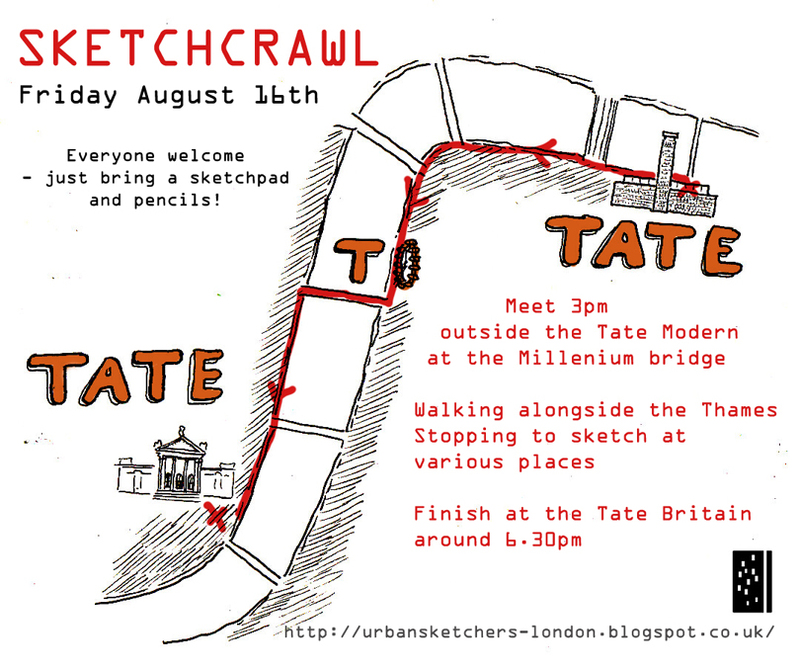 sketching jack the ripper's london! 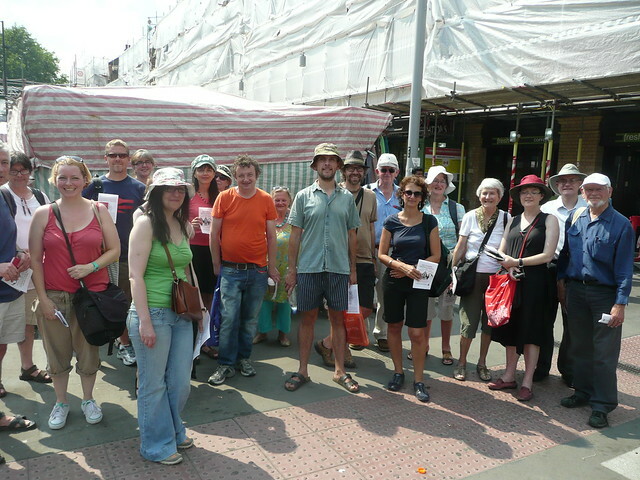 We started at Whitechapel station, bustling with the local market around us. It's been more than a decade since I was last in Whitechapel, and while much has changed, much remained as I remember it. I sketched the station. I don’t imagine Jack the Ripper coming by tube, but the station dates back to the 1870s so it’s not impossible. I wonder how he would have felt about the current extortionate ticket prices. “What a Rip-off” probably. 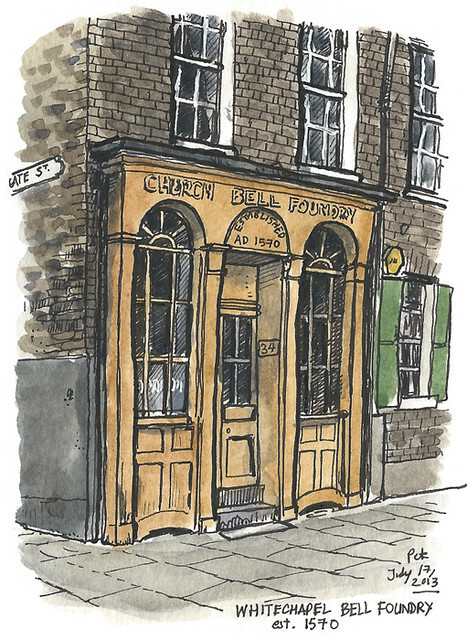 I wandered down Whitechapel Road to the old Whitechapel Bell Foundry. Established in 1570, this is in fact the oldest registered manufacturing company in Britain – or the world, as the various bike tour guides passing by would say. Still, they have a magnificent history (see their website) – this is where the Liberty Bell was cast (though it broke, of course), as well as the bells of St. Paul’s Cathedral, the bell from the 2012 Olympics opening ceremony, and perhaps the most famous bell of all, Big Ben, a bell so famous that most people think it’s a clock. Big Ben is also the biggest bell they ever cast here. I didn’t go in, but sat in the shade of a tree outside while locals stopped and said, oh wow man, and offered to give me cold drinks. 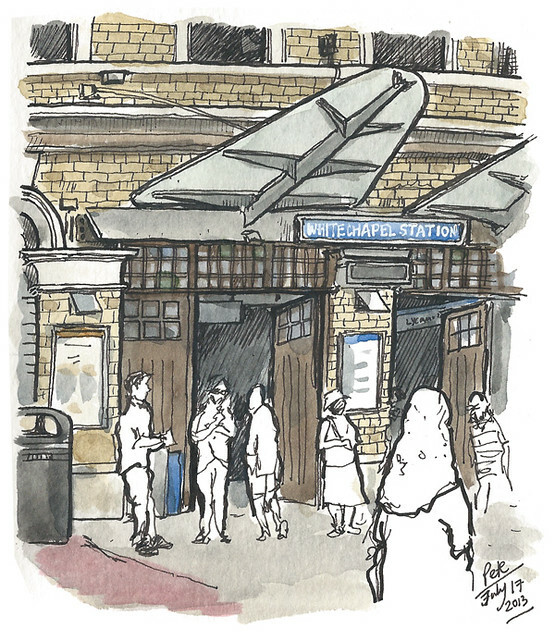 Next, Aldgate East, and stood opposite the magnificent building above the station, and the lovely Whitechapel Art Gallery. 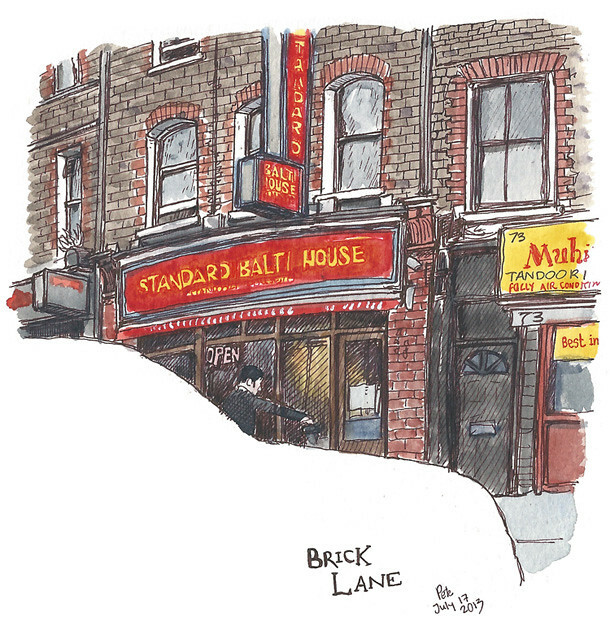 I had planned on finding the "canonical five" Ripper sites and sketching the cobbles in Mitre Square, but the evening was pressing on and I needed to head up Brick Lane. 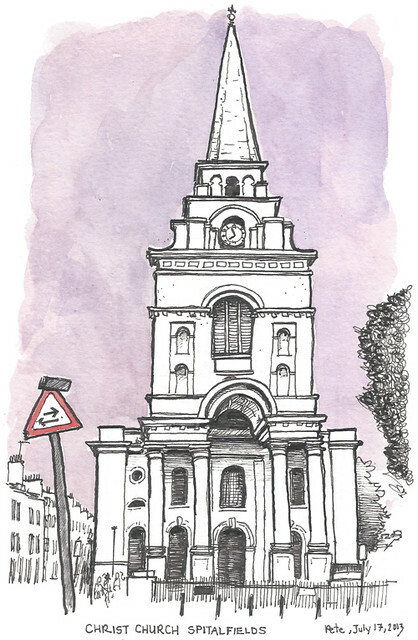 And finally to Christ Church Spitalfields, built by Nicholas Hawksmoor in the English baroque style it was completed in 1729 (so definitely a big part of Jack’s London). And that's it! 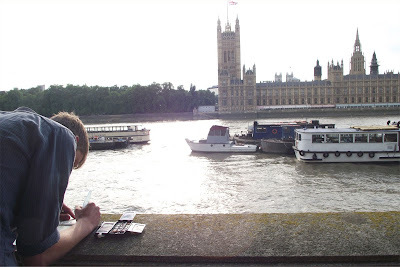 This sketchcrawl was definitely the highlight of my trip, and it was nice to reconnect with an area I had all but forgotten. 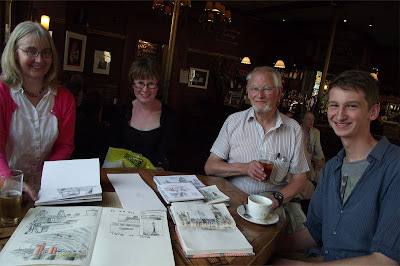 I really enjoyed the final meeting at the end where we looked in each others sketchbooks, and it was lovely to meet such excellent and artistically diverse sketchers. And I finally got to meet James Hobbs! 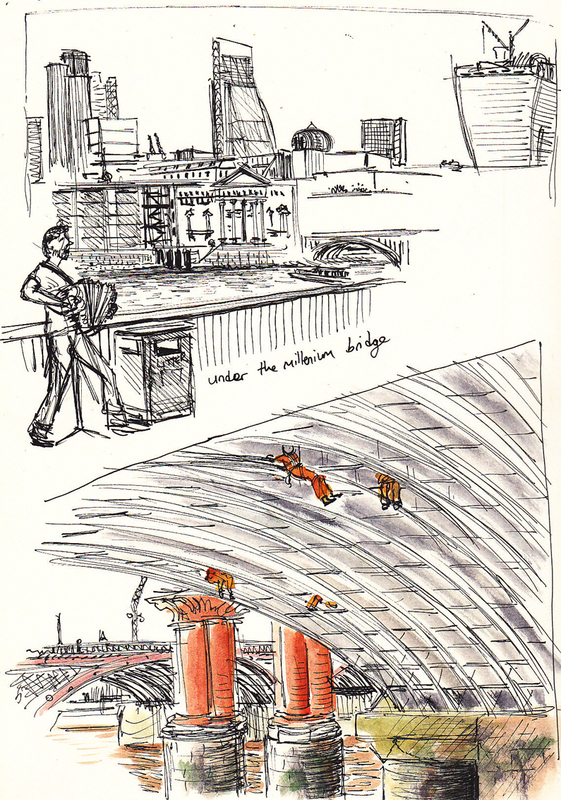 Amazing to look through his sketchbook. Afterwards, several of us popped into the Ten Bells pub across the street for a pint. 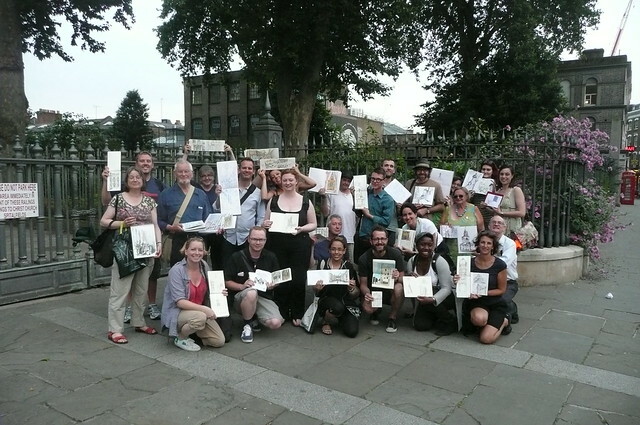 I look forward to meeting the London sketchers again on a future visit! London’s skyline changes every time I come back. The City now has at least two skyscrapers that were not there last year, dwarfing other prominent 21st century additions like the Gherkin. It is an ever-changing city and it always has been. 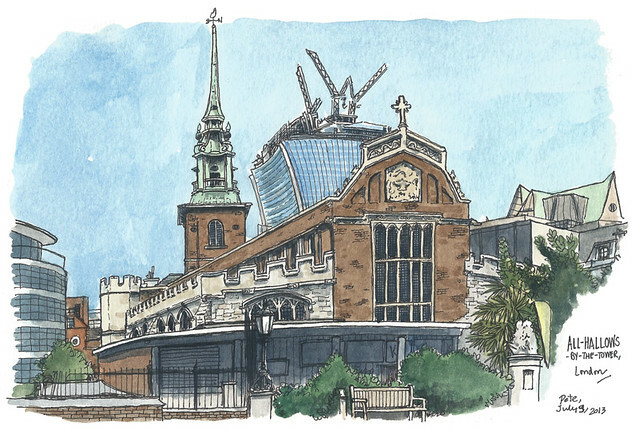 Above is one building that, while subject to many modifications and rebuildings over the centuries, has pretty much the entire span of London history within its foundations. All-Hallows-By-The-Tower, a small and often overlooked church which sits right next to the Tower of London (which is rather handy given its name), is said to be the oldest church in London, founded in 675, though its main building and spire date from the 1650s (it survived the Great Fire, though it was greatly rebuilt after it being damaged in the Blitz). In the background, one of London’s newest towers is being constructed in the background. The 'Walkie-Talkie' I think it is called. I like to think there will be a time in the future when kids are trying to figure out the reason for its name and not being able to figure out what a walkie-talkie is supposed to be, just as people do now with such places like Pall Mall and St.Andrew-by-the-Wardrobe. I popped inside for a look around, to learn a bit more about its history. There is an actual Saxon-era arch still standing, and if you go below to the crypt museum you can see some original Roman tiled paving – this church was built on the site of a building from the days of Londinium. On my open-top bus tours years ago I used to tell Americans the two things I knew about this church: Pennsylvania founder William Penn was baptised here,and John Quincy Adams was married here, you know, President number 6. It was nice to finally come and spend some time looking at it and learning about it. 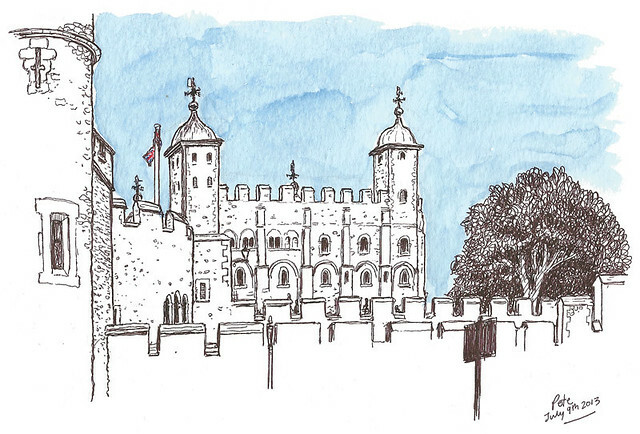 Oh, and here is the Tower itself, sketched immediately afterwards among a throng of passing tourists. No introduction necessary. I recently traveled on the "Tate-to-Tate" Thames clipper boat, and it occurred to me that walking this route would make a good sketching trip. I've been wanting to do some central London Thameside sketching for a while now, and it seems a good opportunity while the weather is still summery. 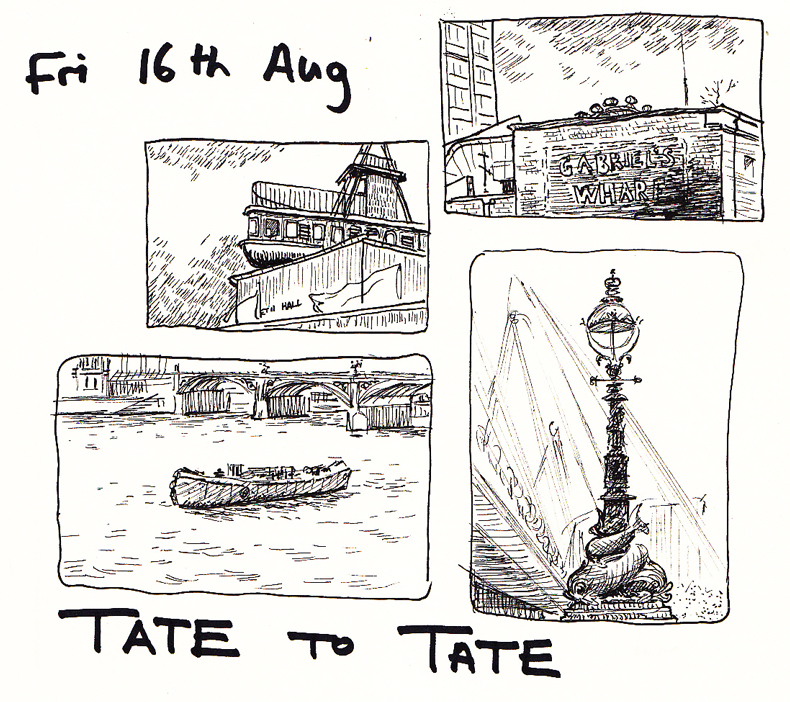 So, with the success of Pete's midweek sketchcrawl recently, I thought we could try a Friday afternoon, for a couple of hours sketching. Apologies to those of you at work, we will do another weekend one soon. To those of you who can make it, I look forward to seeing you! Date: Friday August 16th 2013. 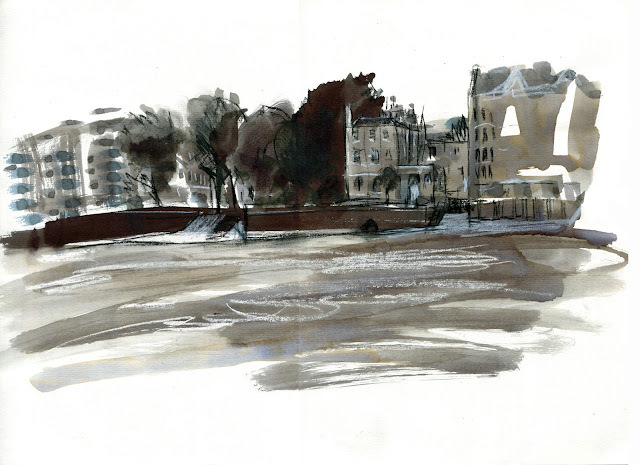 Last month I took a walk along the Rotherhithe shore of the Thames, at the lowest tide of the year. Mostly I took photographs (some of which are on my Facebook page), but I did do one drawing that I like. 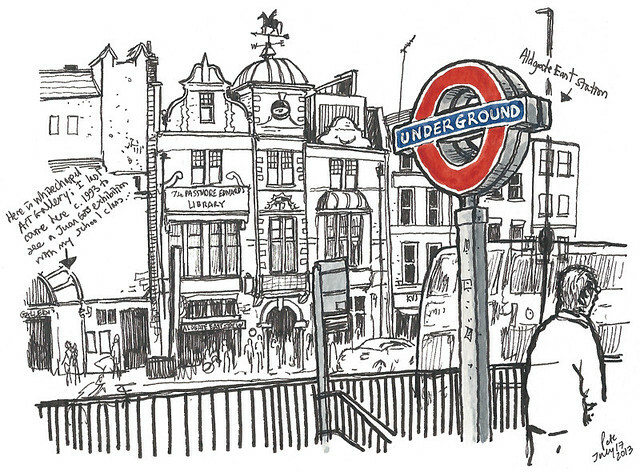 I couldn't resist drawing my favourite pub on the opposite shore. Even though it was the lowest tide, the Town of Ramsgate remains out of reach.